Posted by HubTechInsider in Agile Software Development, Project Management, Software. What are the qualities of bad code? How can you tell if your software project has bad code? Troubled software projects and bad code are facts of life in the software business. Today’s applications, system software, even embedded and operating systems programming is increasing being outsourced or at least distributed. The need for being able to quickly evaluate the quality of software code, describe any known issue in simple aterms and then execute on a planned approach to rectify these issues is greater than ever. A common vocabulary for project teams, refactoring engineers, and project managers and stakeholders is of a fundamental assistance in manageing software development projects. You may find yourself sitting in a meeting or conference room or perhaps on a conference call with a group of computer programmers who are discussing some sections of code, or if you are particularly unlucky, perhaps an entire application of software development project, that is troubled using some of these below listed terms. After each of these negative, “bad code” terms I have tried to describe what is meant by each of these terms for bad software. After each description, I list the term for the opposite, positive “good code” quality contrary to the bad code quality. 1. Fragility: When changes in the software code cause the system to break in places that have no conceptual relationship to the part that was changed. This is a sign of poor design. The opposite of fragility is known as robustness. 2. Immobility: When the code is hard to resuse. The opposite of immobility is known as re-usability. 3. Needless complexity: When the design is more elaborate than it needs to be. This is sometimes also called “Gold plating”. The opposite of complexity is known as simplicity. 4. Needless repetition: This occurs when cut-and-paste of code segments is used too frequently. The opposite of repetition is known as parsimony. 5. 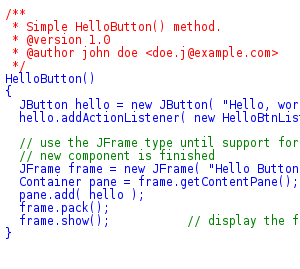 Opacity: When the code is written in such as manner as it is not clear. The opposite of opacity is known as clarity. 6. Rigidity: When the design is hard to change because every time you change something, there are many other changes needed to other parts of the system. The opposite of rigidity is known as flexibility. 7. Viscosity: When it is easier to do the wrong thing, such as a quick and dirty fix, than the right thing. The opposite of viscosity is known as fluidity. In order for your software development project to feature the opposite, more desirable positive qualities to the ones listed above, your project must exhibit a good software architecture, solid software design, and effective coding practices. For further reading on this topic, I highly recommend the excellent book by R.C. Martin, “Agile Software Development, Principles, Patterns, and Practices“, Prentice-Hall, Englewood Cliffs, NJ, 2002. I’m Paul Seibert, Editor of Boston’s Hub Tech Insider, a Boston focused technology blog. You can connect with me on LinkedIn, follow me on Twitter, follow me on Quora, even friend me on Facebook if you’re cool. I own and am trying to sell a dual-zoned, residential & commercial Office Building in Natick, MA. I have a background in entrepreneurship, ecommerce, telecommunications and software development, I’m a Technical PMO Director, I’m a serial entrepreneur and the co-founder of several ecommerce and web-based software startups, the latest of which are Twitterminers.com and Tshirtnow.net. What is Traceability in software development? In my experience working on custom software development projects, the number one cause of project failure is inadequate requirements. When programmers code either without requirements or with inadequate requirements, nothing good ever comes of it. The relationship between the requirements, the source of those requirements, and the system design that is ostensibly being built to enable those requirements, is what code traceability is all about. I think it is very important to point out that regardless of the software development lifecycle process model you and your team happen to be following, be it a traditional “Waterfall” type software model or a so-called “Agile” fixed-iteration development lifecycle, documentation and code traceability is paramount. If your software has provided for a high level of traceability, then the requirements can flow down through the design and code and then can be traced back up at every stage of the process. This makes it a simple matter to trace a coding decision back to a design decision to satisfy a corresponding requirement. In embedding systems software engineering, traceability is vital because hardware constraints can act as limiting factors on design and coding decisions that may not be as easily associated with a requirement as in a non-embedded system design. When even a basic “traceability matrix” is not provided for on a software project, then the lack of a traceability path from design and coding decisions back through to the requirements can lead to severe difficulties in extending and maintaining the system. What is a software traceability matrix? A software traceability matrix document can take many different forms, but one of the most common forms is a table-like document that serves simply as a graphical representation of all of the cross referenced links between project deliverables and artifacts, and the code. 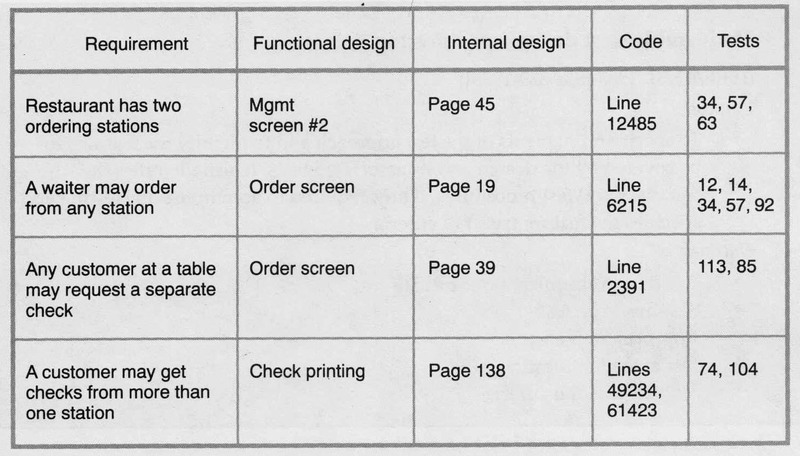 This cross referenced table is constructed, usually using a spreadsheet application program, by listing the relevant software documents and then the doe unit as columns, and each software requirement as a row. An example of a software requirement tracing matrix. If you use a spreadsheet program, then you can create multiple matrices sorted and cross-refernced by each column as needed. For example, you could provide a traceability matrix sorted by test case number, which could serve as a very apropos appendix to the test plan. The traceability matrices should be updated at each step in the software life cycle. For example, the column for the code unit names, things like procedure names, object classes, etc., can not be added until after the code is developed. What are the elements of a good traceability matrix? A traceability matrix is a document, sometimes in the form of a table, that will provide a cross reference between all the documentation and software code in a system. 1. From the requirements to the stakeholders who first proposed these requirements, with the dates they were first proposed. 2. The associations between any dependent requirements listed. 3. From the requirements through to the system design, or functional specification document. 4. From the design to the relevant code segments. (oftentimes referencing the technical specification document). 5. From the requirements to the test plan document. 6. 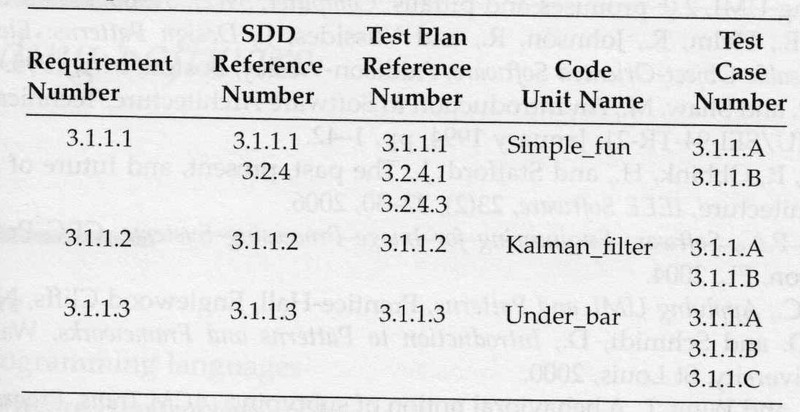 From the test plan to the relevant test cases. Software requirements traceability is the ability for a project team to provide references that document the relationships between the software requirements, their sources, and the system design. If software requirements traceability has been provided well, then the requirements can be linked to their source, to other requirements, and to design elements. Requirements traceability links between the different requirements, source traceability links these requirements to the stakeholders who proposed those requirements, and design traceability link from the requirements to the system design documents. The software requirements document, sometimes referred to as the SRS, or software requirements specification document, MUST be “traceable”, because the software requirements provide the starting point for the entire traceability chain. It is very common within professional project management organizations, or PMOs, to enact and enforce traceability policies which codify how much information regarding requirement relationships is required to be maintain, and the format in which this information is to be presented. There are a number of open source and proprietary open-source tools which can be used to help improve a software organization’s requirements traceability. The overarching goal of software traceability and software traceability matrix is to ensure that for critical software, nothing falls through the cracks. Ultimately there is a way of mapping for each requirement which test cases exist to cover that requirement and the functional specification. As shown in the sample traceability matrix above, one way to show the traceability from requirements through design and testing is through the use of an appropriate numbering system throughout the documentation for the system. For example, a requirement numbered 3.2.2.1 would be linked to a design element with a similar number (the numbers don’t have to be the same so long as the annotation in the document provides traceability). The main intent here is to show that all the appropriate documents and project deliverables are connected through referencing and notation. I’m Paul Seibert, Editor of Boston’s Hub Tech Insider, a Boston focused technology blog. You can connect with me on LinkedIn, follow me on Twitter, follow me on Quora, even friend me on Facebook if you’re cool. I own and am trying to sell a dual-zoned, residential & commercial Office Building in Natick, MA. 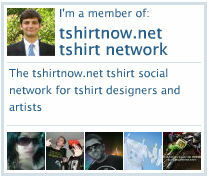 I have a background in entrepreneurship, ecommerce, telecommunications and software development, I’m a PMO Director, I’m a serial entrepreneur and the co-founder of several ecommerce and web-based software startups, the latest of which is Tshirtnow.net.